Starting this year, we will test tools that allow you to use WhatsApp to communicate with businesses and organizations that you want to hear from. That could mean communicating with your bank about whether a recent transaction was fraudulent, or with an airline about a delayed flight. We all get these messages elsewhere today — through text messages and phone calls — so we want to test new tools to make this easier to do on WhatsApp, while still giving you an experience without third-party ads and spam. The tech press seemed to grok the significance of this move (considering their coverage) in spite of historically underrating WhatsApp, even with its ~900M users. As I’ve surveyed the landscape collecting startups and apps that fit into this paradigm, talked with the press, observed how marketers, branding agencies, platform makers, and VCs have come to the same conclusion, I thought I’d jot down a few observations to consider as we plunge headlong into this brave new world. Before I begin, I want to clarify that conversational commerce (as I see it) largely pertains to utilizing chat, messaging, or other natural language interfaces (i.e. voice) to interact with people, brands, or services and bots that heretofore have had no real place in the bidirectional, asynchronous messaging context. The net result is that you and I will be talking to brands and companies over Facebook Messenger, WhatsApp, Telegram, Slack, and elsewhere before year’s end, and will find it normal. Indeed, there are several examples of this phenomenon already, but those examples are few and far between, and fit in a Product Hunt collection rather than demand an entire App Store (wait for it). Additionally, I’m less interested in whether a conversational service is provided by a human, bot, or some combination thereof. If I use these terms interchangeably, it’s not unintentional. It’s just that over an increasing period of time, computer-driven bots will become more human-feeling, to the point where the user can’t detect the difference, and will interact with either human agent or computer bot in roughly the same interaction paradigm. One of the biggest challenges of this paradigm is the discovery of new conversational services. Should messaging incumbents each provide their own conventional app store, where users can browse recommended partners, a la Snapchat Discover or Slack’s App Directory? 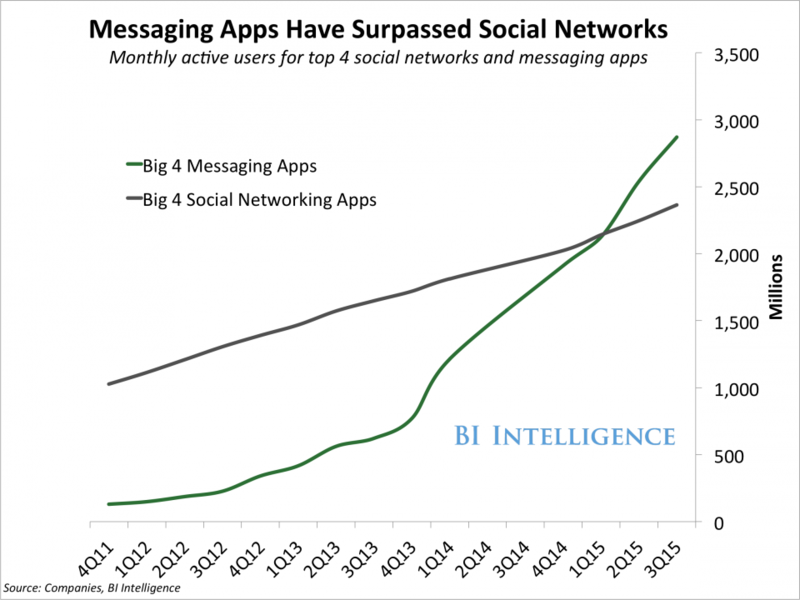 And should these conversational services rely exclusively on distribution from popular messaging apps? …or should these services be accessed in-context through data detectors or through a dedicated expansion interface, as in Facebook Messenger? Or should bots surface organically — i.e. when a friend mentions a bot by name, or invites a bot to join you in a separate thread? This would be more natural, but would require many “patient zeroes” to have original knowledge of the relevant bots in the right moments. This question of discovery is unsolved, and will remain a looming question for the rest of the Messenger-class apps out there. I expect to see more approaches presented at F8, if only because the Messenger Platform was announced last year, and there’s been little announced since then. Discovery of discreet conversational services becomes less of an issue if users are slowly trained to think and type more like programmers. That is, the more that users get frustrated expressing themselves in complete sentences, and the more technically sophisticated they become, the more likely they are to warm to the efficiencies of the command line. With iCloud, we finally got a taste of what cross-device computing should be like (of course, it took several tries). Facebook Messenger and Slack feel like the next iteration beyond iMessage though — instantly and continuously synced to the most recent changes from the cloud. I weave between their desktop and mobile apps without losing a beat, or context. My conversations automatically rearrange themselves according to my behavior, and the bots that I was talking to on desktop are right there when I pick up on mobile. Nothing to install, nothing to configure—just flow. Conversational apps are therefore organized around the way I organize my life, rather than the way the app maker might dictate. The lightness of being in this world is profound. For example, with my new job at Uber, I had to get a new laptop, which invariably meant installing dozens of “comfort apps” that I use to make my environment feel more familiar. 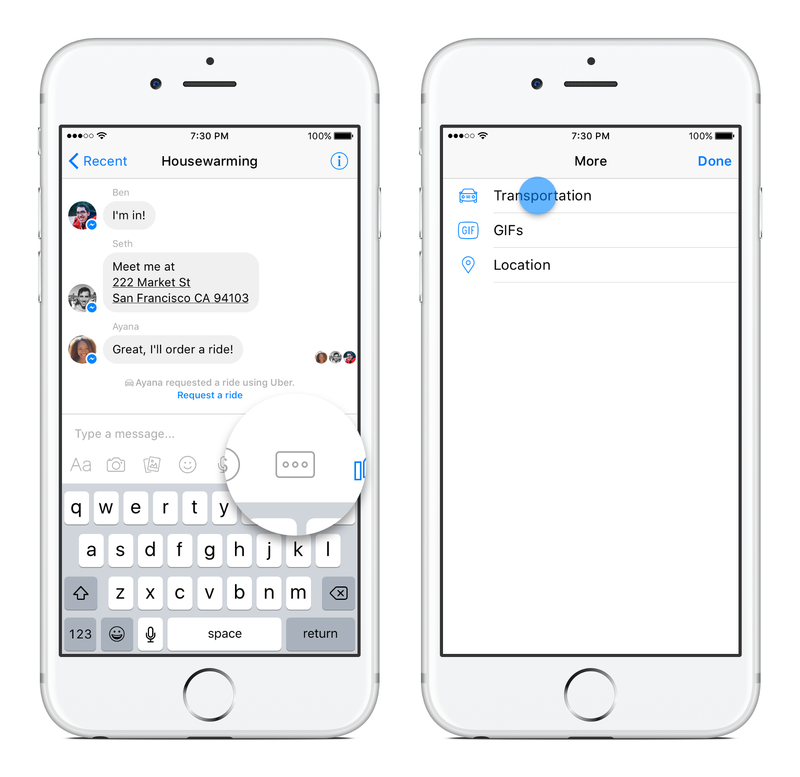 But Facebook Messenger stayed the same — I started it up, and everything was in its right place. This lack of inherent friction in the experience changes a user’s perception of the service, and even though it’s hard to quantify, I intuitively believe this feeling makes an enormous difference in the long term commitment to a platform. This consistency is a form of extreme personalization enabled by conversational interfaces. I guarantee you that if you look through anyone else’s Facebook Messenger threads, Twitter DMs, iMessages, OKCupid messages, or Snapchats that the order, content, and velocity of messages and content will feel extremely foreign, and likely massively uninteresting. Contrast that with a gaming platform where all users go through some kind of elaborate, universal onboarding process, and you’ll begin to grasp how this subtle form of extreme personalization is core to the conversational paradigm. Suffice to say, the verbs we use with traditional apps are irrelevant in the conversational paradigm. We “buy”, “download”, “install”, and “trash” apps. The conversational paradigm is more social, and therefore less technologic. We use humane verbs like “add”, “invite”, “contact”, “mute”, “block”, and “message”. The language of conversation is more accessible to a broader audience, which will in turn accelerate the adoption of conversational agents faster than we saw with desktop apps. No longer do you need to convince users to “download and install” an app — they can just invite a bot to a conversation and interact with it [eventually] like they would a person. Zero barriers to adoption, with minimal risk to the user (i.e. malware, etc). And receiving notifications from bots is to be expected, rather than avoided, because users have been conditioned to receive them from their friends. 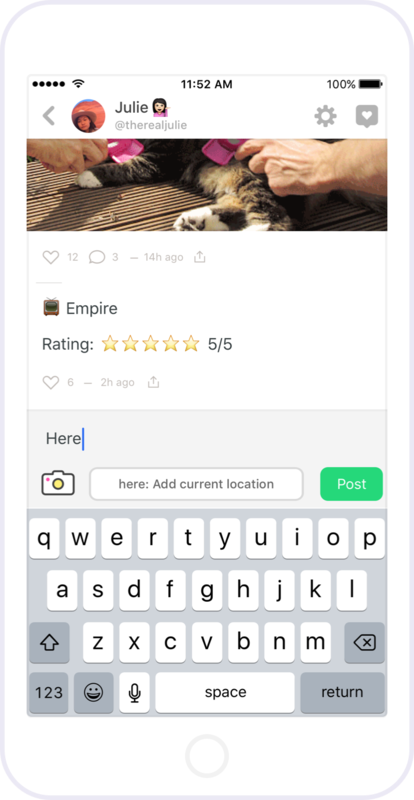 While you may have bristled when that news app alerted you to “new stories”, you might appreciate a particularly friendly newsbot delivering a personalized recommendation with context that you uniquely care about. 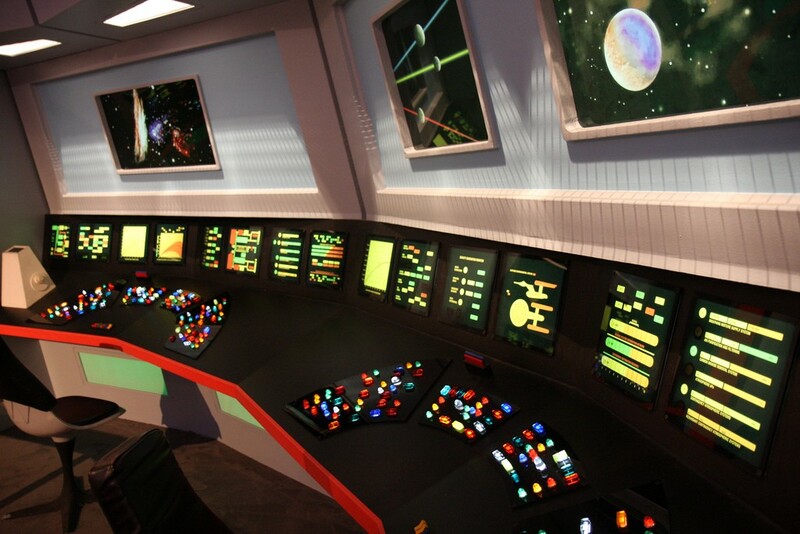 So, I’ve mentioned several aspects of this paradigm shift that have to do with the change in the user experience, but there’s another dimension worth considering, and that has to do with what users of conversational apps bring to the equation: namely, lots of information and capabilities that used to be exceedingly rare in the computing environment. For one thing, the Uber integration in Messenger was made possible because mobile payment mechanisms are now commonplace in chat apps. 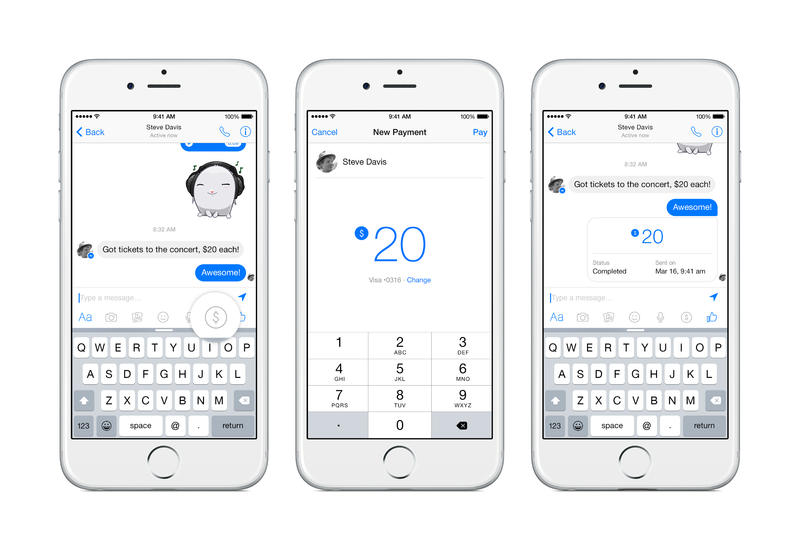 Since you can send money directly within Facebook Messenger, that payment vehicle can in turn be used to pay bots for products. 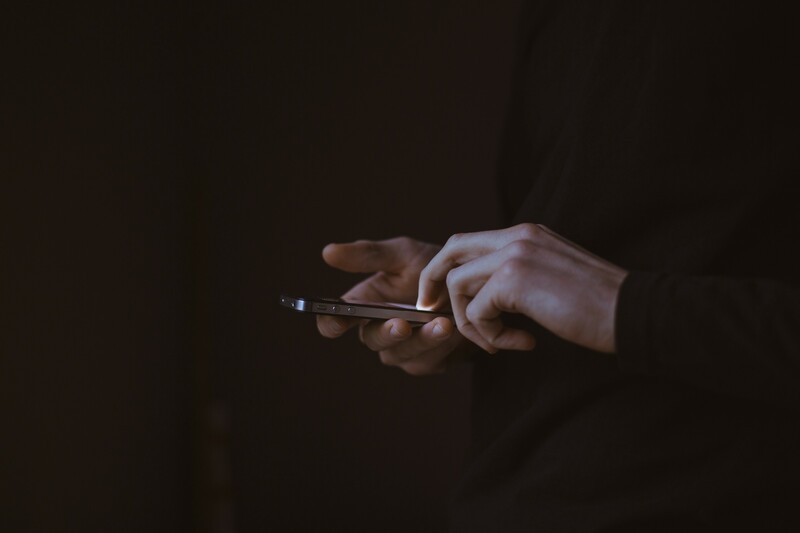 Additionally, conversational mobile apps have a lot more contextual information about users, including location, health, sensor, and social data. This information is useful for fighting fraud, and as such conversational apps (like Operator) will push commerce and purchases into this context aggressively and away from the query-thrashing model (read: Google). Meanwhile, all of this data is also available to clever developers to build interesting and more personal agents and bots. And since each interaction and engagement is tracked, the longer the conversation thread persists, the easier it will be to offer more responsive heuristic approaches that anticipate the user’s specific needs. That is, the more conversational agents will appear to be getting to know you! I mentioned this in my post last year, but we can now see that the voice-controlled hardware trojan horses from the big companies haven’t necessarily been embraced with open arms. Yet. I don’t have specific numbers, so I may be wrong, but my sense is that it’s still very early days for devices like Amazon’s Echo (which is being shrunk) or Google’s onHub. While there continues to be interest in the internet of things and wearables, these kinds of “room computers” don’t seem to have mass consumer appeal, say, compared with the Xbox 360. Still, most people have smart phones, so these dedicated home AI devices may be more about reaching that audience that has thus far resisted obtaining their own smart phone, or only use their smartphone’s basic functionality (i.e. don’t install or use apps). Lessin points out that building conversational bots costs less and happens faster than building and maintaining cross-platform apps. This is critical. [Dealing] with installed client software is slow. You have multiple versions of the same software running on different devices, and you have to ship software that cannot be easily recalled for bugs or errors. Startups have a hard time winning at the game (as I have written about before). The bot paradigm is going to allow developers to move fast again. Faster and lower cost development means that there will be fewer actual “bot businesses” started that need funding; instead, you can take a bot template, tweak it, and launch it — over a weekend. You can collect feedback on how people interact with it and if and only if it drives engagement, then consider what a business to back the bot might look like. This means that service builders will have to become very sensitive to the interaction that their users have with their agents and bots — humanizing the conversation, localizing correctly, and providing a meaningfully useful and differentiated service. Bot discovery and distribution will favor the fastest, most clever, and most responsive bot makers, as word of mouth virality is natural to the conversational context unlike in the App Store. Well organized development teams will grow their service commensurate with their customers’ needs, moving at their speed, and without being held back by opaque app store submission processes. When the new version is ready for release, the code is pushed and instantly every user gets the latest version. No updates, no installs, no delay. This means competition will gradually shift from glossy marketing spend (think: Boom Beach and Clash of Clans) and an obsession with ranking among the top of an App Store category to emphasizing friend of friend referrals and word of mouth spread. Lastly, we’re entering a moment where there is no clear winner per se, and where the strategy to win both consumers’ and developers’ hearts hasn’t been determined. 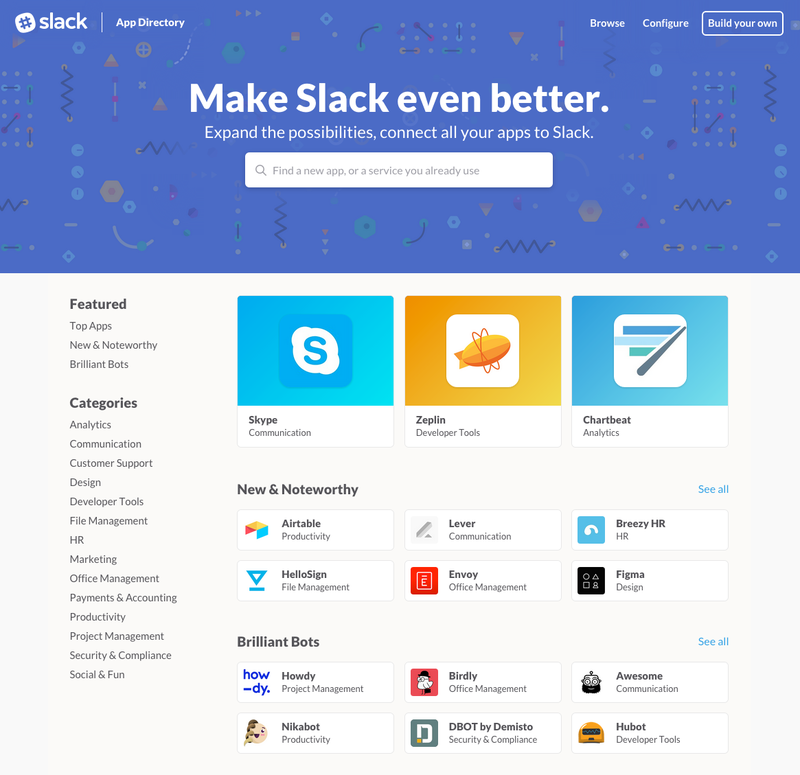 Slack’s API is obviously very popular. Facebook’s Messenger platform and WhatsApp have huge distribution but are shadowed by Asian rivals like WeChat and Line. Telegram’s Bot API shouldn’t be overlooked. Google may yet offer its own chatbot messaging platform (superseding Hangouts?). Other platform builders are currying favor with developers and capitalizing on the enterprise segment of the market. Intercom and Smooch enable brands and companies to message their customers from within their existing apps. Twilio and Layer offer more fundamental components that can be composed into increasingly sophisticated offerings. It’s still too early to name a breakout winner, but it’s going to be fascinating to see how these different conversational platforms shape up and differentiate, and how each will control, give access to, or promote third parties to their users. Will everything move to the conversational paradigm? No, but there are a lot of apps that shouldn’t exist as stand-alone apps, and that are wallowing in obscurity or disuse. By reducing the cost and friction of trying out new services, the conversational commerce paradigm promotes an entirely new era of lightweight experimentation. Over time, service builders can focus more on the apparent value that they can deliver through the familiar conversational channel, and can finally dispense with requiring users to learn their app’s needlessly bespoke interface. This shift is good news for service builders, and it’s good news for users. I can only imagine how far along we’ll be when 2017 rolls around. I’ll be on a panel at SXSW 2016 called Get the Message! The Rise of Conversational UI with Jonathan Libov, Jeff Xiong, and Julia Hu. Come check it out! This article has been translated to Chinese, Japanese by Masahiko Sato, Korean by Keywon, and Portuguese (twice!) by Leandro Rosa and Daniel Sun, Spanish, and German. It has been syndicated to the New York Observer and Inside. ☞ Chris reads every response on Medium or reply on Twitter, so don’t hesitate to let him know what you think — do tag your tweets with #ConvComm. The shortlink for this post is http://j.mp/convcomm-2016.